Situated in the north of El Hierro at 645 meters above sea level, the La Peña Viewpoint presents the most magnificent panorama in the island. The seemingly endless seascape and is a reminder that there is so much to see in this world. From this vantage point set on a towering cliff overshadowing parts of the valley village, one is bound to feel like a speck of sand in the vast shoreline. Unlike other viewpoints, visitors don’t have to look far and beyond to see an assembly of beauty. Thanks to its legendary architect, the mirador itself is a sight to behold. While it stands out, it also blends well with its surroundings like the bright moon in a sea of stars. At La Peña Viewpoint, travelers don’t just look at tourist attractions – they are standing on one. A perfect balance between architecture, art, and nature, such is the trademark of the legendary César Manrique. The renowned artist and architect, has created many architectural jewels in his home island of Lanzarote that helped launch its tourism campaign. His idea of art in nature and nature in art eventually landed on the shores of El Hierro. In search of a new landscape canvas, he found his way up a bare cliff in Guarazoca. It was secluded yet out in the open. Most importantly, it had the most panoramic views the island could offer. As such, it became the venue for his next showpiece. 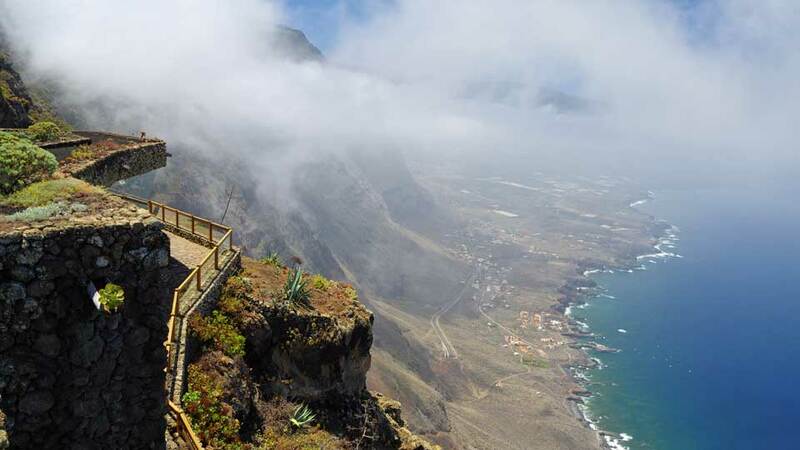 By 1989, the La Peña Viewpoint sat proudly on the cliff and opened its door to the public. Although exposed, its stone and wood structure blended with nature. 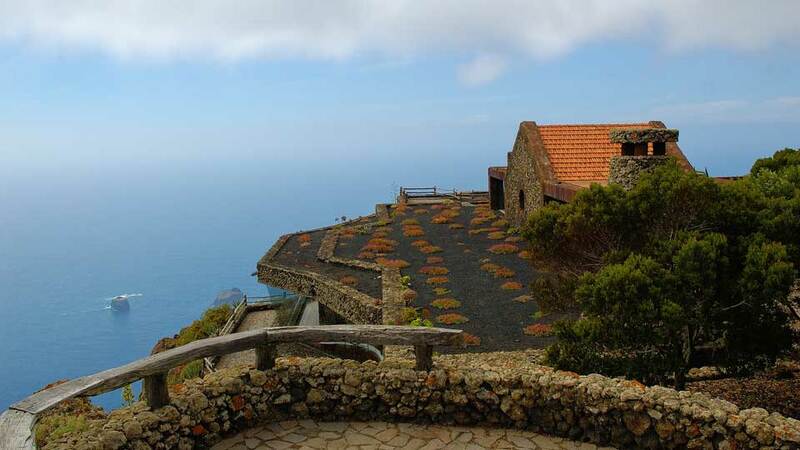 The work of art and the spectacular views it offers has since become one of El Hierro’s top tourist spots. To witness the best of El Hierro and its untouched beauty, travelers must head up north to Valverde and visit the mirador. Upon arrival, a stunning scenery assaults the senses. Welcoming the guests is a marvelous garden housing an array of plants native to the Canaries. If that is not enough, then there are the Juniper trees. These gnarled trees bent and shaped by trade winds are part of the natural wonders of the island. César Manrique designed La Peña Viewpoint featuring traditional El Hierro architecture with a twist. Cobblestone and rock bricks exterior infuse the structure to its surrounding while glass panel enclosings add a contemporary touch. The glass door opens to a wooden staircase that leads to a fabulous restaurant. However, it is not only the great food that has attracted a multitude of people. Glass windows offer a spectacular scenery that complements the gastronomic experience. Cesar is a genius of arts, but there’s no better artist than nature itself. And the real masterpieces in the viewpoint is the natural wonders that encompass it. From the vast deep blue sea, the towering cliff of Rosco de Tibataje rises to the sky protecting valley. On one side of the mirador, a stunning view of nature’s creation, the El Golfo valley stirs the soul of onlookers. Formed by violent eruptions millions of years ago, the beauty of the sculpted landscape can only be seen in all its magnificence from the viewpoint. On another side of the mirador, the Rocks of Salmor (Roques de Salmor) curiously peeks out from the ocean. Because of its peculiar form, some have poetically likened these rocks to beads of necklace dropped into the sea. While mesmerizing guests with its unnatural beauty, it is also home to seabirds and the giant lizards of El Hierro. La Peña Viewpoint is open daily from 9:00 am to 10:30 pm and there is no admission charge. Bring binoculars to treat the eyes to more astonishing sights in and around the viewpoint. Wait for the sunset and watch the sun plunge into the sea as the sky turns nuclear with orange to red hues. Look at the seemingly suicidal goats walking and hopping along the cliff ledges. Fret not, they never fall. The best way to reach La Peña Viewpoint is by car. At the moment, the island’s public transportation system does not serve the western part. While some accommodations offer their services, there are also plenty of car hires in the busy towns in El Hierro. Dining in the Restaurante El Mirador de La Peña is worth every cent. They have an extensive menu of Canarian dishes, and most ingredients are local produce. Their best-sellers such as caldo de huevo (egg soup), quesadilla, vegetable soup, chicken stroganoff, smoked cheese with honey, and potatoes with mojo sauce are best paired with a local La Frontera wine. For the last course of the meal, try bienmesabe (made with eggs, almonds, lemon, and sugar) with vanilla ice cream, helado cremoso de frutas, or the local cheese cake. Another must-try is their coffee. In fact, out of everything served, coffee is the most popular. Guests can savor its aromatic flavor while soaking in the fantastic view. La Peña Viewpoint is a magical place where the sight of nature can heal hearts and minds. It is a place where one can find peace and experience the harmony between man and nature. Amidst the sights of the valley of El Golfo, cheer on strangers as they prepare to base jump from the cliff. Sip coffee and let the eyes drift from one natural wonder to another. The magnificence of El Hierro and the valley has been there for millennia, and all it took was one genius to set the stage from where one can stand and experience the magical experience. A day spent here may end, but the captivating story told in sights is forever etched into the minds of its visitors.